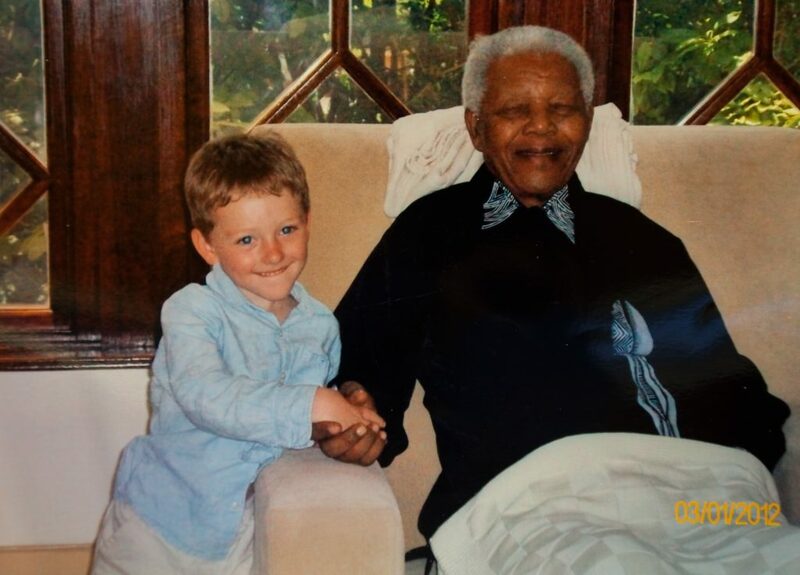 I met Mr. Mandela in 2012 when I was about four years old. I am ten now so my memories are quite faint. I got to meet him because my mother is friends with Mrs. Xoliswa Ndoyiya who was Mr. Mandela’s chef at the time. Mama Xoli arranged the visit. We went to his house in Houghton, Johannesburg. There was a police box outside the house and an x-ray scanner before you could go in. We were supposed to wait in a side room but I got bored of waiting because I was only little. It seemed like a long, long wait. My mum says it was only about ten minutes but I swear it felt like more than an hour. So, I took matters into my own hands. I remember I ran into the next room. It was a big sitting room. I thought it would be empty but it wasn’t. Mr. Mandela was sitting there with his grandson Ndaba Mandela reading the newspaper. I jumped on the sofa where Ndaba was. Ndaba picked me up and swung me around over Mr. Mandela’s head. He laughed and smiled but I was quite frightened because he looked very old and I was scared that Ndaba might drop me. Once before my dad had picked me up like that and then dropped me by mistake so I was worried but luckily Ndaba didn’t drop me. Mr. Mandela asked me what my name was and I said ‘Josiah’. He said ‘ah like in the Bible’. He asked me if I came from Queenstown because Mama Xoli comes from there and he knew that she had invited me but I said “no I come from Hartbeespoort”. He had a deep voice but it was very sweet like a choir singer. He was sitting in an arm chair with a blanket over his legs. I was surprised that he was so old because my mum had told me he was a freedom fighter so I had expected a person who looked like they were in the army or a superhero. He was so old that he kept closing his eyes as if he might fall asleep. I said to him “are you so tired because you have been out all night fighting crime?” Mr. Mandela seemed a bit confused by my strange question but he said “yes, we must all do that”. He asked about my school and what I wanted to be when I was grown up. I told him I was going to be a Power Ranger. Mr. Mandela’s doctor came in and took a photograph of the two of us together on her cell phone so I have a picture of this special day. It is not a great photo – my eyes are red in it but I am still glad to have the picture. I feel very proud to have met Mr. Mandela. I met the man who saved our country from apartheid. You told the story so well. And how brilliant that you have this special photo-memory. What a great story! And such a gorgeous photo. Something to always treasure. This is a memory to treasure for ever.